The biggest killer of whales and dolphins across the world is accidental capture in fishing gear, or ‘bycatch’. Several hundred thousand whales and dolphins are estimated to die this way each year.. Many others are injured. There are very few parts of the ocean where there is fishing and this is not a serious issue. But, the extent of the threat, the species concerned and the fisheries involved vary and generally, are not well documented. To most individual fishermen, a whale or dolphin accidently encountering their gear is an infrequent event. No fisherman wants to catch a whale or dolphin by accident, and it is an upsetting event. But, given the size of the global fisheries, in 2006 it was estimated that the numbers of whales, dolphins and porpoises caught each year is in the hundreds of thousands. Most dolphins trapped underwater by fishing gear die of asphyxiation (suffocation). It’s likely that many suffer more stress and a longer time-to-death than animals in a slaughterhouse. Hundreds of thousands of whales, dolphins and porpoises die in fishing operations annually. Bycatch has pushed vaquitas in the Gulf of California and Maui dolphins in New Zealand to the brink of extinction. Most of the endangered North Atlantic right whales and Gulf of Maine humpback whales off the US coast have been entangled in fishing gear. Whales, dolphins and porpoises can hold their breath for long periods of time. The smallest porpoise can remain underwater for over five minutes between breaths, and sperm whales can dive for over an hour between surfacing. The damage seen on bycaught individuals shows that many of them struggle desperately to escape and, often sustain horrific injuries. The severe injuries regularly seen in bycaught whales, dolphins and porpoises are evidence of the suffering victims go through. Rope and netting often cause cuts and abrasions to the skin, tightening as the individual struggles and cutting deeper into the flesh. In extreme cases, fins and tail flukes can be totally or partially amputated by the tightening gear. Bodies of bycaught dolphins are commonly recorded as having broken teeth, beaks or jaws and extreme internal injuries. Large whales who become entangled in fishing gear have been found with severe lacerations deep into their blubber and even into their bones. As large whales are often powerful enough to swim away and pull the gear with them, the rope continues to tighten and cut into their body over time, often resulting in a slow and painful death that can last months. For a more in-depth understanding of the issue, you might want to read our report ‘Shrouded by the Sea’. This study, based on research by the University of Bristol, reveals the harrowing details of how whales and dolphins slowly meet their death, many suffering extreme injuries in what can be a very drawn out underwater struggle. WDC campaigns to reduce and - where possible - eliminate whale and dolphin bycatch in fishing gear of all kinds..
We work on government stakeholder teams where we help to develop regulations to reduce this threat. We work with international forums, such as IWC and CMS, to develop policy and encourage national governments to do more to reduce bycatch. We engage with fishermen, to find solutions. We help to develop best practise to assist fishermen to reduce bycatch. We push for and draft new legislation to improve existing bycatch measures. We critically review existing legislation for its effectiveness. We research vulnerable whale, dolphin and porpoise populations. We campaign to raise awareness and let people know what they can do to help. Fewer than 500 North Atlantic right whales remain, and less than 100 breeding females. We know that most of the whales have been entangled in fishing ropes during their lives. In 2017, at least 18 individuals died due to entanglements and ship strikes. WDC are working on the ground with all the stakeholders to come up with innovative and effective ways to prevent these deaths and to save this population. Vaquita are the most endangered porpoise or dolphin in the world, due to fishing with nets to catch totoaba for the Chinese market. They are only found in the northern park of Mexico's of the Gulf of California. Unless the fishing nets can be removed from their habitat, they will be extinct within the next decade. Only 63 Maui dolphins remain. The population has crashed because they get easily caught in fishing trawler and static gillnets. WDC are working on the ground to protect Maui and their close relatives, Hector's dolphins from the threats they face, and particularly fishing in their core habitat. With the exception of tuna, it’s almost impossible to know if the fish we eat comes from a fishery with a bycatch issue. The best way to ensure that your canned tuna is the most dolphin friendly it can be is to buy tuna caught with a pole-and-line, or one-by-one fishing, where tuna are caught by fishermen one at a time, using one hook and one line. This traditional method has a significantly lower level of bycatch. Clear labelling on tuna cans is required, with labels including the tuna species in the can, where it was caught and the fishing method used. Look for labels that indicate your tuna purchase was caught one-by-one or by pole-and-line fishing; and if you are unsure ask your retailer or look online, there’s plenty of helpful information now available. It’s more tricky with other seafood but ultimately, it’s important that consumers seek out the most sustainable products available. Some seafood guides are available, and bycatch might be a consideration in these, for example: www.seafoodwatch.org and www.goodfishguide.org. 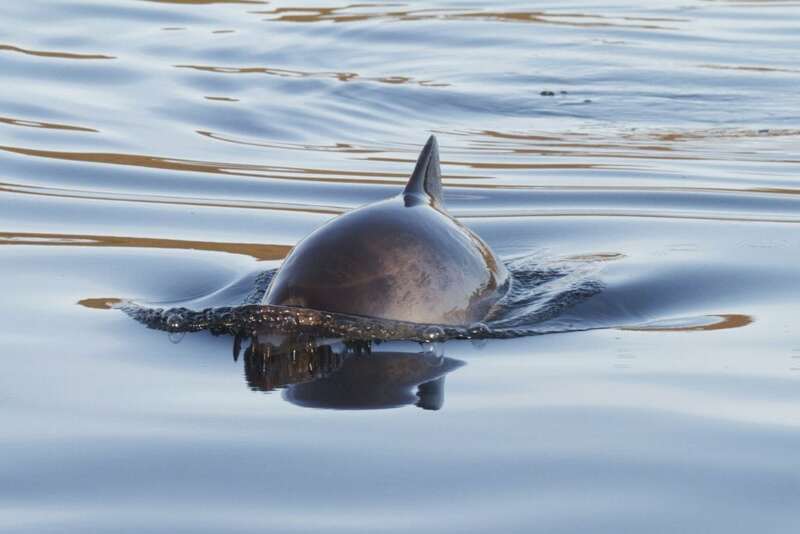 WDC is calling for governments, regulatory bodies and fisheries stakeholders to act urgently and decisively to end this unacceptable suffering of whales, dolphins and porpoises. This will require the collection of better data and changes to the way fish are caught including gear modifications, gear marking, and possible fishing restrictions to reduce this threat. By adopting a whale or dolphin, by making a donation, or by fundraising for WDC, you can help us save these amazing creatures. Adopt a whale or dolphin and help us end these needless deaths. Your gifts help us take action to save whales and dolphins. Run, bake, walk, cycle… what could you do to help?